Yes, I like making hand warmers. These were unbelievable simple. They were made from the sleeves of a wool sweater that I fulled (shrunk until it won't shrink more). All I had to do was cut off the sleeves and cut a hole for the thumb. That is a great thought! And with the rest of it you an make a handbag. 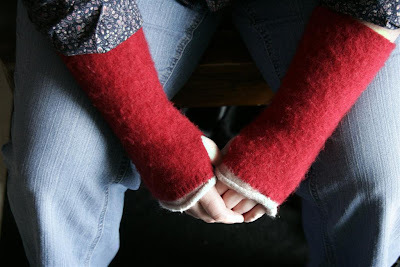 I have seen regular knit arm-warmers,but never repurposed felted ones! Genius! I would love some of these for working in our weaving studio at school. It gets so darn cold in there. These would work perfect! Thanks for sharing. I love these so much! It looks like you could have knit them!